Dropping a Pierce Brosnan spy thriller during the last days of August does not bode well for anyone encouraged by the thought of the actor getting back into the genre. The trailer and TV spots hope you’ll get excited at the sight of Brosnan back, but there is this element of them trying to sell it as Old Man Bond. 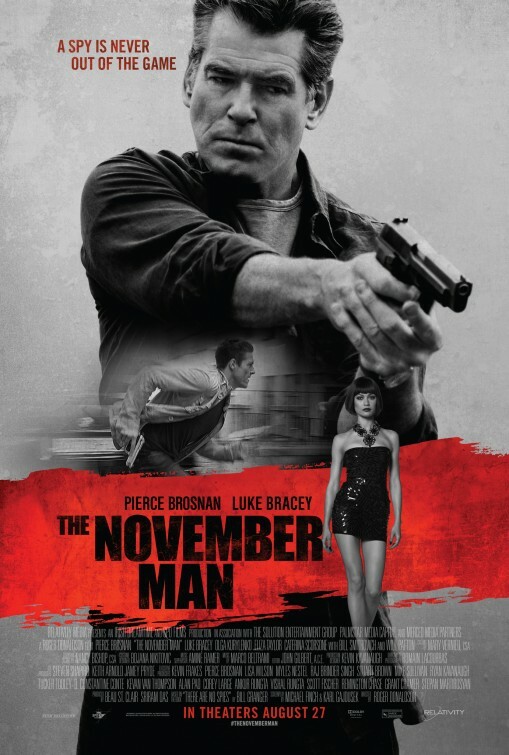 Considering the time of year it’s hitting theaters and the fact that Relativity Media hasn’t really had a huge marketing push behind it (the lame posters don’t help), it’s understandable how one might approach “The November Man” with a certain amount of trepidation. So, maybe because my expectations were put aside, I found this somewhat flawed film to be quite an engaging and kind of unpredictable feature. Surprise surprise. Ex-CIA agent Peter Devereaux (Pierce Brosnan) spends his days in a Switzerland town near a beautiful lake overseeing a cafe he owns, free from life in the fast-paced espionage world. Despite trying his best to live quietly off the grid, his former boss, John Hanley (Bill Smitrovich, a different turn from a great character actor) tracks him down and shows him enough files and provocative photos to reactivated him back in the field. Hanley convinces Devereaux to track down and assist an undercover source and former colleague, Natalia Ulanova (Medila Musliovic), who is working closely alongside corrupt politician, Arkady Fedorov (Lazar Ristovski), a man who took part in some reprehensible activities involving young girls back when he was a soldier in the Chechnyan War. Natalia is in possession of some incriminating information that would prevent Comrade Fedorov from political ascension and therefore, she is in danger, as is anyone with connections with Fedorov’s dark past. He’s made sure they’ll be taken out by employing an unassuming assassin Amila (Amila Terzimehić), a woman with few words and a very elastic stretching routine (Terzimehić, a former gymnastics champion from Bosnia), to eliminate any threat. Things get intense when Devereaux’s retrieval of Natalia goes sour in Belgrade (it’s not his first failed mission), which finds him facing off against his former protege, David Mason (Luke Bracey, the Australian actor who played Cobra Commander in “G.I. Joe: Retaliation”, yeah, I forgot too), a hot head who still has a great deal of respect for Devereaux. Indignant and furious, Devereaux locates local social worker, Alice (Olga Kurylenko, a Bond alum from “Quantum of Solace”), who may know a thing or two about a girl who Natalia was intent on learning more about. In a hot second, Devereaux and Alice are on the run, pursued by both Mason and his team of gung-ho CIA agents as well as the lethal Amila, with Devereaux promising to protect her and get to the bottom of it all. Mason is being micro-managed by both Hanley and CIA higher-up, Weinstein (Will Patton, in a brief role) and starts to wonder if there’s something more going to this mission and his former mentor. Much blood is shed and property damaged during the cat-and-mouse game between Devereaux and Mason, with the two characters uncovering a few secrets that change how they view the past, present and maybe themselves (but let’s not get too existential). For a film that, on the outside just looks like an attempt to fill an action slot in theaters, there’s actually enough absorbing plot twists and engaging performances here to entertain. I found myself easily engaged and involved. Sure, they are some moments in the pacing that unnecessarily slow down the pace and even a few holes in the otherwise intriguing storyline, but I wasn’t too worked up by any of that. I was too busy enjoying Brosnan and Kurylenko work together, as two characters collided together under extreme pressure and forced to rely on one another. 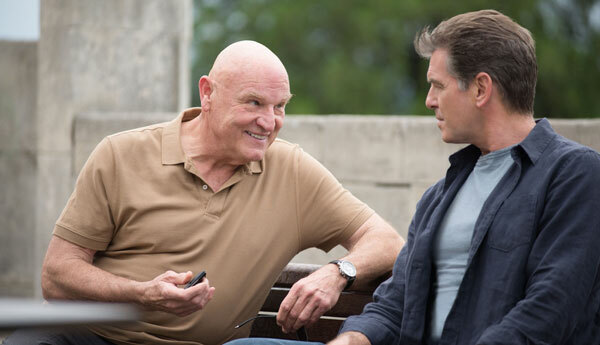 If you’re fans of either of these actor’s previous work, they should be enough reason to check out “The November Man”. Brosnan has wanted to bring this character to the big-screen for quite some time. Working from a series of spy novels written by Bill Granger (a Chicago journalist who died a couple years back), guarantees plenty of material to work from to ensure a possible new spy series for the actor. But Brosnan and fellow co-producer, Beau St. Clair, had to be patient and wait for everything to align just right. 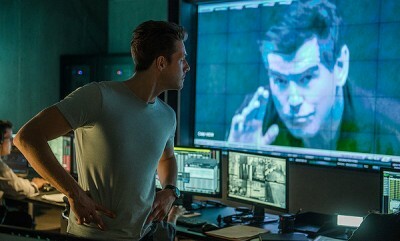 They found a pair of decent screenwriters in Michael Finch (“Predators”) and Karl Gajdusek (“Oblivion”) to adapt Granger’s There Are No Spies and then landed Roger Donaldson (“No Way Out” and “The Bank Job”, to name a few) as director, which reunited Brosnan with his “Dante’s Peak” helmer. 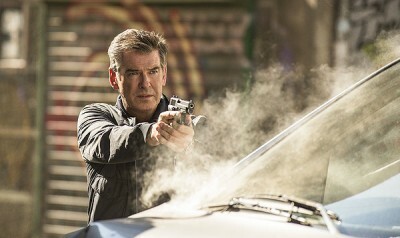 I can easily condone Brosnan getting back into this genre. The actor still holds a considerable amount of charm and is also quite capable of injecting a certain amount of irritable indifference to his characters that may have us guessing where he stands morally. He makes it easy and intriguing to follow a character like Peter Devereaux. You may think you’ve seen Brosnan play all his spy game cards during his four films as Bond, but keep in mind that after the first two, his 007 started to succumb to the ridiculous conventions of the Roger Moore era. The world-weary spy we see in “The November Man” could easily be the older version of the risk-taking edgy Bond from “Goldeneye” and “Tomorrow Never Knows”. There are those who’ll say Brosnan’s too old for all this and to that I ask – too old for what? We have “The Expendables 3” in theaters right now and a 62 year-old Liam Neeson starring in at least two action thrillers a year. Brosnan (a year younger than Neeson), who looks younger than 58 year- old Roger Moore did when his last Bond film, “A View to a Kill” came out in 1985. Here, Brosnan is more invested and committed than any of those Expendable actors or anything I’ve seen Neeson in recently. Brosnan can more than handle another spy series and, as long as the writing is solid, I’d be interested in following him on more Devereaux adventures – as long as he acts his age. Plus, there’s a certain freedom in portraying an R-rating, mostly humorless spy, free from the inevitable restrictions and conventions of Bond.